So today’s post is going to be about sweaters (kind of). I LOVE sweaters. Sweaters are so comfy when it’s cold outside, and it’s a perfect item to throw over jeans or dress up with a cute skirt. However, my picks for today aren’t of your typical oversized knitted shirt that you think of when you think of a sweater. Instead, I chose my favorite trends of items that are made out the same material as your favorite sweater. For example, a very popular item this cold weather season are sweater dresses. Sweater dresses are shorter in length (coming slightly above or below your knee depending on your height) with varying necklines. They are also very comfy! I love to wear mine with a pair of leggings and boots. I added a statement necklace to add a pop of color and sparkle. The sweater vest. 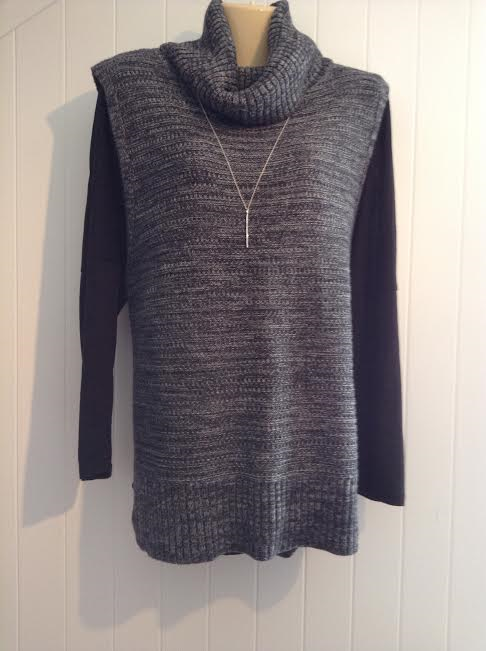 Another versatile piece to add to your wardrobe! You can layer it over a long sleeved shirt or dress without being too bulky. I wore this over the weekend with a pair of skinny jeans, boots, and a black shirt. I received a ton of compliments. I especially love this one; the fabric is super soft, and I love the collar. The sleeveless turtleneck sweater. This can be worn alone or with a shirt underneath. It’s long, lean cut is flattering to the figure; not bulky at all. It looks great with jeans or leggings and a pair of boots. Well there you have it; three items that are as soft, comfortable, and versatile as your favorite sweater but are a little more chic and trendy!